Almost Time to Take the Bull by the Horns? The difference between feeder cattle and live cattle is simply based on where the animal is at in terms of the cattle cycle. Feeders are the calves (usually 6-8 months old) that have been placed in the feedlots to fatten up. They usually weigh in between 650 and 850 pounds. Once the feeders have grown to a weight of 1,000 lbs. or more, they are considered ‘fat’ or live cattle. Normally, it takes about four or five months for the feeders to reach this weight level. At that point, they are ready to be shipped to the packers for slaughter. Because feeder cattle and live cattle are the same animal at different points of the cattle cycle, it should come as no surprise that the prices of these two markets are highly correlated. By viewing almost four decades of price history, one can readily see that these two markets are highly correlated as they almost seem to move in lockstep with each other. Although feeders and live cattle move together tightly, there are still going to be times when one of these markets will be grossly overpriced/under-priced compared to the other. Right now is one of those times. Historically, there have been several times when the feeders gained a premium of 20 cents or more over the live cattle. It never lasted, though. Each time the spread reversed and narrowed. Over the last decade, however, the spread has made new historical highs before reversing. Between 2004 and 2006 the feeders traded either side of a 32-cent premium before the trend finally reversed. 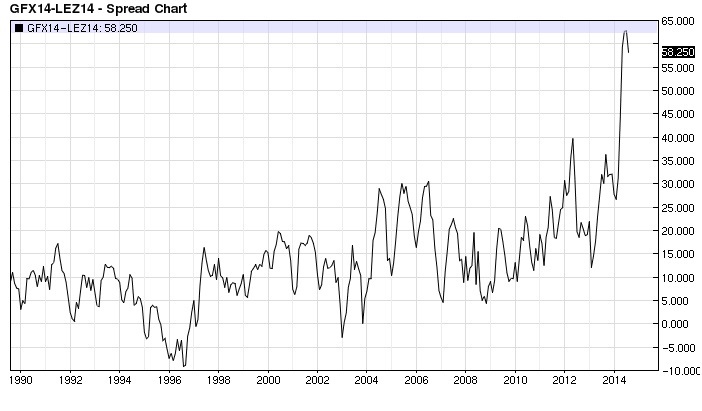 The feeder/live cattle spread did not see the 32-cent level again until 2012. That year it raced to a new all-time high of nearly 41 cents before it crashed back to Earth. 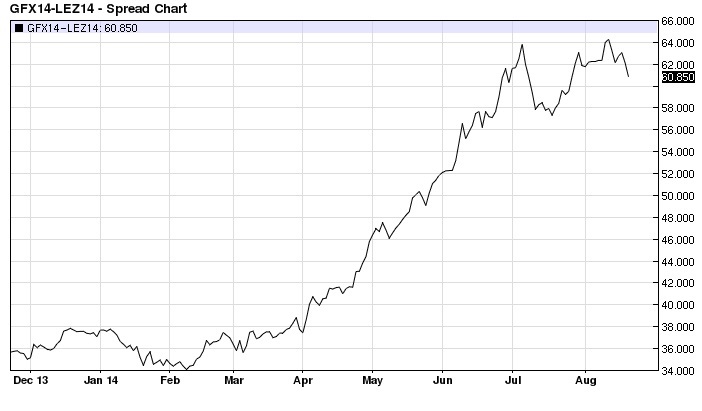 Here in 2014, the spread between feeders and live cattle surged to a new all-time high. History suggests that this will once again reverse. Therefore, spread traders should be watching for a setup to get short. The problem with looking at the feeder/live cattle spread by itself, however, is that both the feeders and the live cattle have also traded to new all-time highs in terms of absolute price. Therefore, we should look at the relationship between the two markets not only in terms of the spread between them, but also in terms of the ratio between the two markets. 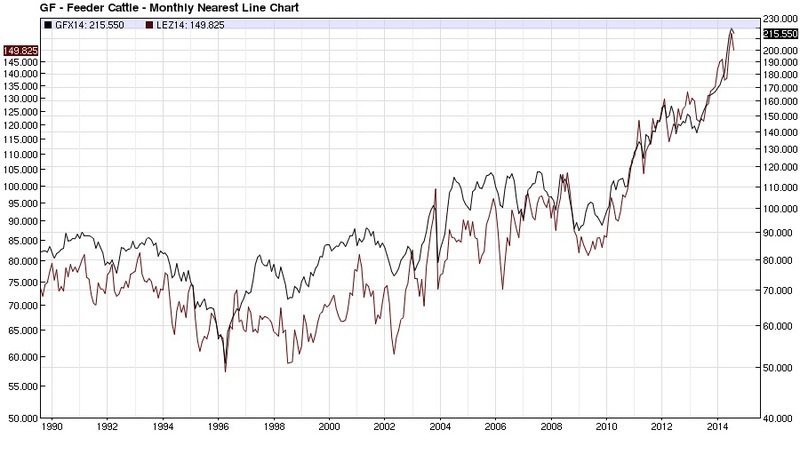 The ratio can normalize the extremes of a spread relationship. It comes in quite handy as a useful filter to measure when a spread is ‘expensive’ or ‘cheap’ if the underlying market prices are also at historic extremes. 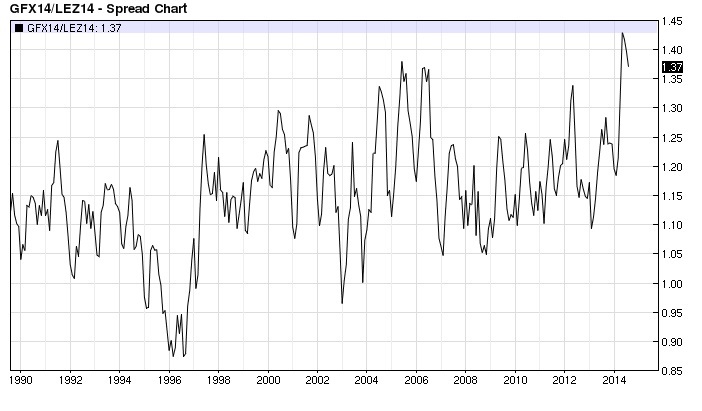 Looking at four decades of history, there have only been a handful of times that the feeder/live cattle ratio has made it to 1.3:1 or higher on the monthly nearest-futures chart. This summer the ratio reached an all-time high of 1.43:1. The nearest-futures weekly chart shows that the ratio is still around this level. Therefore, we can say with certainty that the feeders are trading at an historic extreme against the live cattle. Looking at the end-of-year contracts, the relationship between November feeder cattle and December live cattle is at lofty heights. The spread is currently around 61.75 (premium feeders) and the ratio is at 1.41:1. From a trader’s perspective, this might be the spread to watch for a potential trade opportunity. First, a close below the rising 50-day Moving Average (currently around 60.17) for the first time in over four months could be indicate that the bull market is over. Secondly, a break of the July low of 57.35 would mark the first time since February that the spread has traded below a prior month’s low. This would alter the bullish price structure of higher monthly highs and higher monthly lows. If the July low is not breached by the time September starts, the trend change signal could be raised to a break of the August low. Once a trend change signal is triggered, consider it negated on a two-consecutive day close .50 points above the contract high (currently 64.30) that precedes the trend change signal. Just for grins, the blog will make a hypothetical trade by shorting one 50,000 lb. November feeder cattle contract and simultaneously buying one 40,000 lb. December live cattle contract if the spread closes below the 50-day MA. Initially, the spread will be liquidated on a two-consecutive day close .50 points above the contract high (currently 64.30) that precedes the trend change signal.